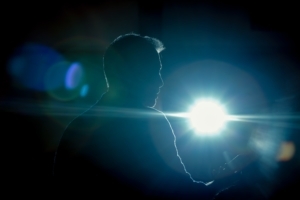 A One Day intensive transformational workshop that will give you the tools to build and embody authentic physical, vocal and psychological Leadership Presence. 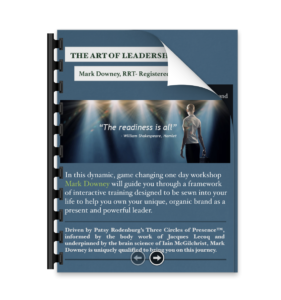 In this dynamic, game changing workshop Mark Downey will guide you through a framework of interactive training designed to be sewn into your life to help you own your unique, organic brand as a present and powerful leader. You will learn to develop a consistency in your presence and your impact from daily interactions, to meetings and presentations, lower your stress and enhance your energy. 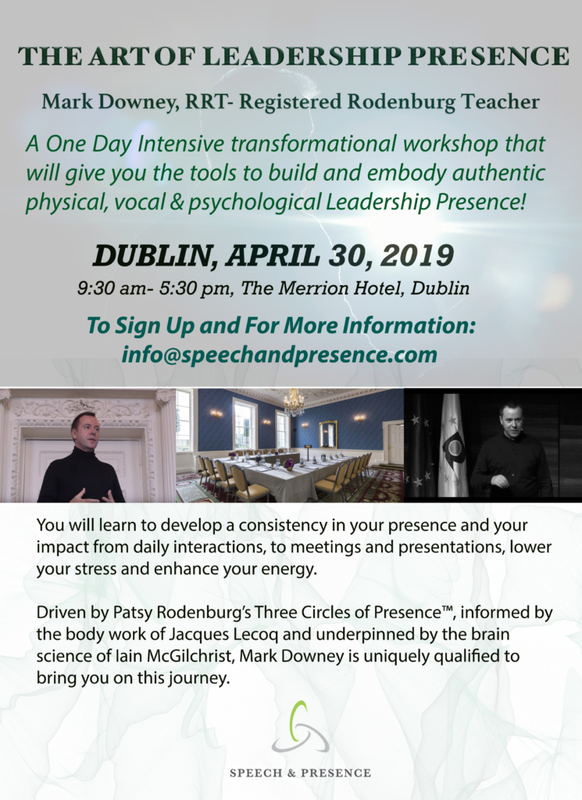 Driven by Patsy Rodenburg’s Three Circles of Presence™, informed by the body work of Jacques Lecoq and underpinned by the brain science of Iain McGilchrist, Mark Downey, RRT (Registered Rodenburg Teacher) is uniquely qualified to bring you on this journey. “You have a lovely way about you to coach people wherever they are to wherever they need to be.” Barbara Moynihan, MD, On Your Feet. Free webinar follow up support is included. There is a discounted price of €350 if you enroll before March 31st! Click on the image below to download The Art of Leadership Presence Brochure for more information. Mark Downey, Registered Rodenburg Teacher. Mark Downey, Dublin, Lisbon, Europe, Leadership Skills Courses, Leadership Presence, Leadership Development, Leadership Impact, Executive Coaching, Executive Presence, Communication Training, Presentation Skills, Learning and Development ,Story Telling for Business, Charisma Coach, Creativity for Business, Webinar Training, Public Speaking Coach, Public Speaking Training, Public Speaking Course, Motivational Speaker, Keynote Speaker, Keynote Speaking, Public Speaker, Public Speaking Agency, Voice Coach, Networking, Registered Rodenburg Teacher, Patsy Rodenburg, Second Circle, Certified Voice Coach, The Patsy Rodenburg Master Teacher Certification Program, The Right to Speak, Ted, Presence, Presence in Workspace, Online Coaching, Online Training, Media Training, Pitching for Business ,The Art of Negotiating, Media Interview, Camera , Impactful Meetings, Successful Interviews, Interview Training, Voice Coach, Voice Coaching for Business, Voice Training, Training, Europe, Confidence Building, Business, Engagement, Training, Personal Development, Strong Leader, Business Development, Start Up, CEO, Crisis Management, Language Leader, Speaking at TED Conference, TED Talks, Public Speaking, Speech Writing, Storytelling, Management Training, Human Resources, Entrepreneurship, Professional , Start Up Company Training Courses Programmes, Presence, Language Skills, Conference, Conference Speaker, Web summit, Dublin, Ireland, Lisbon, Irish Business, Performance, Portugal, Europe, Speech and Presence, Mark Downey, The Art of Leadership Presence, Tedex.